The anthology Ever Yours: The Essential Letters, contains 265 of Vincent van Gogh’s letters, which is nearly a third of all the surviving letters he penned. In a long and winding letter to his brother Theo dated Thursday, 24 June 1880, van Gogh shines light on his independent mind. Now one of the reasons why I’m now without a position, why I’ve been without a position for years, it’s quite simply because I have different ideas from these gentlemen who give positions to individuals who think like them. Later, in the same letter, he defines two types of idlers. I’m writing you somewhat at random whatever comes into my pen; I would be very happy if you could somehow see in me something other than some sort of idler. Because there are idlers and idlers, who form a contrast. There’s the one who’s an idler through laziness and weakness of character, through the baseness of his nature; you may, if you think fit, take me for such a one. Then there’s the other idler, the idler truly despite himself, who is gnawed inwardly by a great desire for action, who does nothing because he finds it impossible to do anything since he’s imprisoned in something, so to speak, because he doesn’t have what he would need to be productive, because the inevitability of circumstances is reducing him to this point. Such a person doesn’t always know himself what he could do, but he feels by instinct, I’m good for something, even so! I feel I have a raison d’être! I know that I could be a quite different man! For what then could I be of use, for what could I serve! There’s something within me, so what is it! That’s an entirely different idler; you may, if you think fit, take me for such a one. In the springtime a bird in a cage knows very well that there’s something he’d be good for; he feels very clearly that there’s something to be done but he can’t do it; what it is he can’t clearly remember, and he has vague ideas and says to himself, ‘the others are building their nests and making their little ones and raising the brood’, and he bangs his head against the bars of his cage. And then the cage stays there and the bird is mad with suffering . ‘Look, there’s an idler’, says another passing bird — that fellow’s a sort of man of leisure. And yet the prisoner lives and doesn’t die; nothing of what’s going on within shows outside, he’s in good health, he’s rather cheerful in the sunshine. But then comes the season of migration. Ever Yours: The Essential Letters sheds light on the turbulent and beautiful life of history’s greatest luminaries. 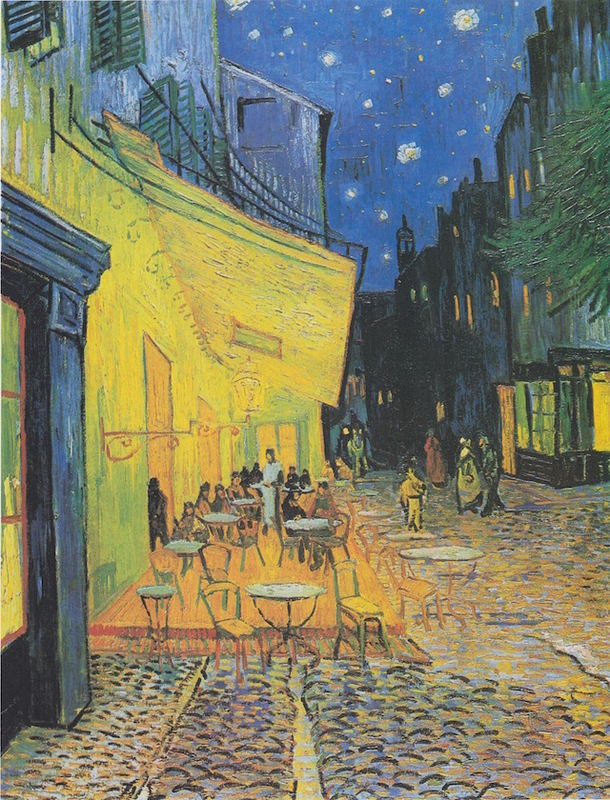 Van Gogh didn’t become popular until shortly after his death. To this day it’s unclear whether his letters drove the initial interest in his art. On the third of April, 1878, in a noteworthy letter to his brother Theo, van Gogh sheds light on his intentions about how to live. I’ve been thinking about what we discussed, and I couldn’t help thinking of the words ‘we are today what we were yesterday’. This isn’t to say that one must stand still and ought not try to develop oneself, on the contrary, there are compelling reasons to do and think so. But in order to remain faithful to those words one may not retreat and, once one has started to see things with a clear and trusting eye, one ought not to abandon or deviate from that. As far as being an homme intérieur et spirituel is concerned, couldn’t one develop that in oneself through knowledge of history in general and of certain people of all eras in particular, from biblical times to the Revolution and from The Odyssey to the books of Dickens and Michelet? And couldn’t one learn something from the work of the likes of Rembrandt or from Weeds by Breton, or The four times of the day by Millet, or Saying grace by Degroux, or Brion, or The conscript by Degroux (or else by Conscience), or his Apothecary, or The large oaks by Dupré, or even the mills and sand flats by Michel? It’s by persevering in those ideas and things that one at last becomes thoroughly leavened with a good leaven, that of sorrowful yet always rejoicing, and which will become apparent when the time of fruitfulness is come in our lives, the fruitfulness of good works. The ray from on high doesn’t always shine on us, and is sometimes behind the clouds, and without that light a person cannot live and is worth nothing and can do nothing good, and anyone who maintains that one can live without faith in that higher light and doesn’t worry about attaining it will end up being disappointed. He who lives uprightly and experiences true difficulty and disappointment and is nonetheless undefeated by it is worth more than someone who prospers and knows nothing but relative good fortune. Do let us go on quietly, examining all things and holding fast to that which is good, and trying always to learn more that is useful, and gaining more experience. Woe-spiritedness is quite a good thing to have, if only one writes it as two words, woe is in all people, everyone has reason enough for it, but one must also have spirit, the more the better, and it is good to be someone who never despairs. Living means we will inevitably experience sorrow and disappointment. If we but try to live uprightly, then we shall be all right, even though we shall inevitably experience true sorrow and genuine disappointments, and also probably make real mistakes and do wrong things, but it’s certainly true that it is better to be fervent in spirit, even if one accordingly makes more mistakes, than narrow-minded and overly cautious. It is good to love as much as one can, for therein lies true strength, and he who loves much does much and is capable of much, and that which is done with love is well done. If one were to say but few words, though ones with meaning, one would do better than to say many that were only empty sounds, and just as easy to utter as they were of little use. Love is the best and most noble thing in the human heart, especially when it has been tried and tested in life like gold in the fire, happy is he and strong in himself who has loved much and, even if he has wavered and doubted, has kept that divine fire and has returned to that which was in the beginning and shall never die. If only one continues to love faithfully that which is verily worthy of love, and does not squander his love on truly trivial and insignificant and faint-hearted things, then one will gradually become more enlightened and stronger. We must launch out into the great sea of life. Launching out into the deep is what we too must do if we want to catch anything, and if it sometimes happens that we have to work the whole night and catch nothing, then it is good not to give up after all but to let down the nets again at dawn. 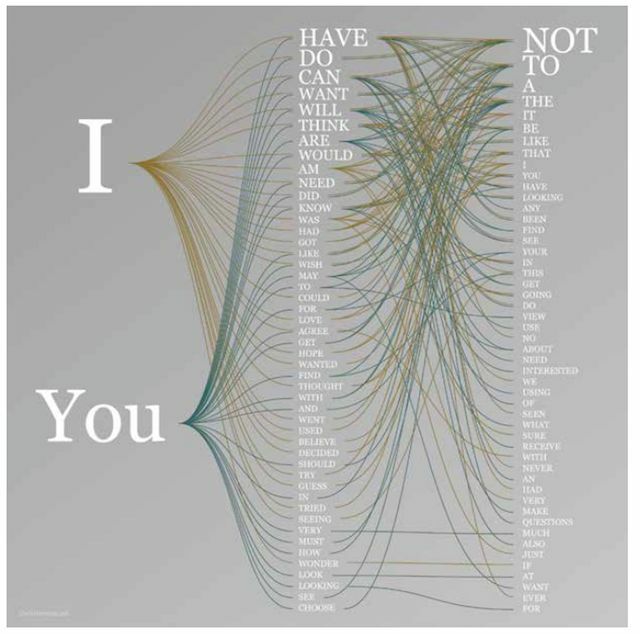 So let us simply go on quietly, each his own way, always following the light ‘sursum corda’, and as such who know that we are what others are and that others are what we are, and that it is good to have love one to another namely of the best kind, that believeth all things and hopeth all things, endureth all things and never faileth. And not troubling ourselves too much if we have shortcomings, for he who has none has a shortcoming nonetheless, namely that he has none, and he who thinks he is perfectly wise would do well to start over from the beginning and become a fool. We are today what we were yesterday, namely ‘honnêtes hommes’, but ones who must be tried with the fire of life to be innerly strengthened and confirmed in that which they are by nature through the grace of God. Ever Yours: The Essential Letters is a collection of some of Vincent van Gogh’s best letters which shed light on a remarkable talent and his artistic notions. You never hear, ‘George increased market share by 30 percent,’” Huffington said at a recent event at Soho House in New York City. What you do hear in eulogies, she says, are stories of “small kindnesses.” Interestingly that’s also how to get ahead in the workplace. It’s well known that details make good art great. Subtle word choices separate great poets from amateurs. Small flourishes define superlative architecture. Tiny considerations make products world-class (“Jobs spent days agonizing over just how rounded the corners should be,” writes Walter Isaacson about the Apple II in Steve Jobs). 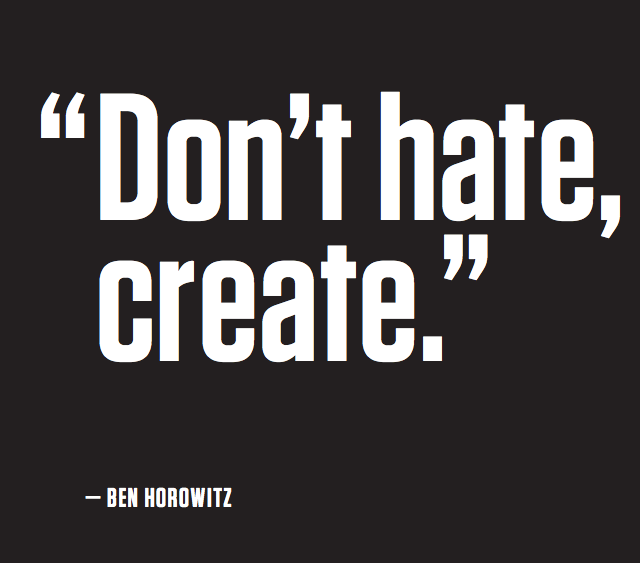 I think the same can be said about building a great business. Tiny considerations in the interactions companies have with their customers are all about focusing on people before profits—and, paradoxically, this can yield huge returns. This is the mentality that Wharton professor Adam Grant talks about in his research on corporate “givers” versus “takers.” In various now-famous studies in his book Give and Take, Grant has shown that the most successful people in the workplace tend to be the ones who give selflessly to others without expectation of returned favors. Research by Jim Stengel, former global marketing head at Procter & Gamble, shows that this also works at a corporate level. Businesses “center[ed] on improving people’s lives outperform their competitors,” he writes, after studying a decade of market performance of fifty thousand brands. When I look at other fast-growing companies with voracious users, I see small kindnesses everywhere. Uber recently upped the ante for me on car services when I got into one of its town cars in San Francisco. The driver had placed fancy jars of candies in the console for passengers. It was a small thing, but somehow it made me feel like the most important customer in the world. I gave him five stars. Tumblr’s terms of service reflect a culture of fun and user-centeredness: they use plain English and colloquialisms and throw in humor to make the read bearable. Few people read terms of service, and Tumblr doesn’t have to do this; they do it because they care about the little things. Google has famously kept its home page to a minimum number of words (currently I see sixteen, mostly the header and footer) in order to respect users’ time and not distract from the one thing they want: search. And Google periodically brings smiles to our faces by replacing its logo with themed “Doodles” on special occasions, such as the fiftieth anniversary of Dr. Who or Frankenstein author Mary Shelley’s birthday. If I had my way, every business would adopt the manifesto that’s painted on the front wall of the Manhattan office of my friends at NextJump.com. The block letters read, “Our Mission: Do all the little things, so that others can do the things they were meant to do.” Free tattoos, fun “About Us” pages and invoices, plainspoken terms of service, and smile-inducing logo hacks are small investments, especially when compared with the costs of customer acquisition through advertising. But these kindnesses pay big dividends and are some of the ways new companies can hack the ladder to credibility and customer success in a short time. 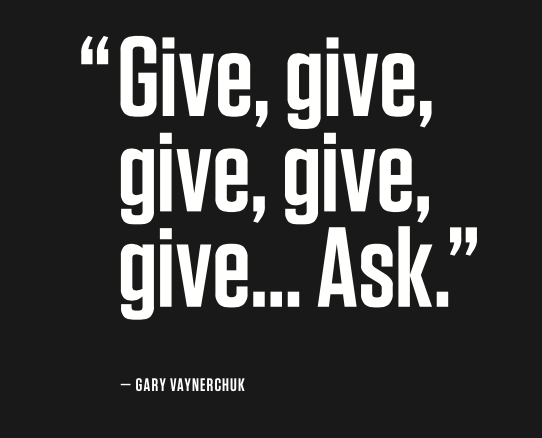 As Dr. Grant says, the more they give, the more successful they are. Indeed, a culture of tiny kindnesses isn’t just good for the world. It’s good for business. Make Your Mark and Thrive add to our wisdom on how to live a meaningful life. While ‘managing by bestseller’ is a misguided approach to fixing organizational problems, there is a lot to be learned from the leading experts and entrepreneurs on what’s different about building a business today. 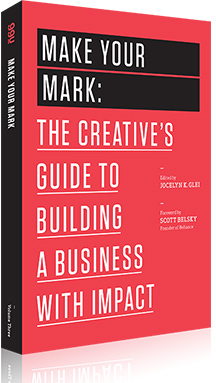 Make Your Mark: The Creative’s Guide to Building a Business with Impact, edited by Jocelyn Glei, features insights from twenty-one leading experts and entrepreneurs to explore the principles that propel some of today’s most successful companies. In the foreword to the book, Scott Belsky, the Founder of Behance and author of Making Ideas Happen, points to one of the fundamental problems with creativity: it’s often undiscoverable. And if it’s undiscoverable it has no impact. For me, creativity is solving problems in new ways and conceiving new ways of looking at the world. Creativity can be expressed in many forms, like art, science, and thought. But creativity is all too often undiscoverable and incomprehensible. Creation, he argues, “must be made accessible for consumption.” Creativity alone, is not enough. We need to make it consumable by channeling and packaging it. The best businesses are purpose driven. But you can’t go far without an incredible product experience. What guides all great product development are the twin ideals of “an unstoppable enthusiasm for bringing something great into the world and a relentless focus on usability.” Making good products takes time. Enter Sebastian Thrun, the leader behind the team that created Google Glass and the Google Self-Driving Car. He’s also the co-founder of Udacity, which is trying to disrupt education by improving the learning experience. Thrun does a Q&A in the book and it’s one of the best things I’ve read recently. How do you focus your energies at the beginning of a project? When thinking about products, I like to use a mountain-climbing analogy. The first step is to pick a peak. Don’t pick a peak because it’s easy. Pick a peak because you really want to go there; that way you’ll enjoy the process. The second thing is to pick a team you trust and that’s willing to learn with you. Because the way mountain climbing really works is that you can’t climb the entire route perfectly. You have to know that you are going to make mistakes, that you’ll have to turn around, and that you’ll have to recover. You also have to maintain your sense of purpose. For a long time, it may feel like you’re on the wrong path, but you must have the resilience to forge ahead. You just have to keep moving uphill. It’s about the process not the outcome. For me, the journey is much more delightful if you can derive pleasure from the process every day, rather than at the end of the year. If your goal is to IPO and get rich, then you’re going to be in for a very long, very sad ride. Because most people don’t IPO and don’t get rich. Our most important asset is our time, so I think it’s best to manage your time well right now and be happy about it, rather than focus on some deferred goal, like buying a fancy car in the future. The data shows that people who are rich aren’t any happier, so you might as well derive your happiness from what you are doing today. How does iteration figure into your process? Do you think it’s best to create a functional prototype as soon as possible? To return to the mountain idea, if you think about it, there’s no other way to get up the mountain than taking a hundred thousand steps. You could have all the meetings and all the documentation and work for weeks on end to make the perfect plan. But in my opinion, all you’ve done at that point is lost time. You’ve done nothing. You’ve learned nothing. Sure, if this mountain has been climbed ten thousand times before, then you just get the book, and the maps, and you follow the same steps. But that’s not innovation. Innovation is about climbing a mountain that no one has climbed before. So there ought to be some unknowns along the way because no one has solved the problem yet. And when you’re innovating, sheer thinking just won’t work. What gets you there is fast iteration, and fast failing. And when you fail, you’ve done something great: you’ve learned something. In hindsight, it might look a little embarrassing, and people will say, “You should’ve known that.” But the truth is you couldn’t have known because it’s unchartered territory. Almost every entrepreneur I know has failed massively many, many times along the way. What’s the most common mistake that people make when they’re developing a product? One mistake I see a lot is the eternal thinker, the perfectionist. This is the person that builds all the components without putting them together, because there’s perfection in component development. And they have this idea that if you only put things together right before launch, everything will go fine. Of course, that never happens. The second mistake I see is more of a character issue, which is being discouraged by failure. Where you do something three or four times, spend half a year in development, and think, “Oh my god, I’m not there yet, let me change my career . . .” So that’s a lack of perseverance. The last one I see is being driven by fear. When your competitor does something new, you become fearful and decide that you’re going to change course. But every single time you do this, you’re already behind your competitor and that’s just a bad idea. You have to have faith in yourself, and believe in your vision. At some time, everybody is driven by fear. But we need to—as much as we can—take fear out of the game. One way to do this is to imagine that you are already successful. You’ve looked into the future, and you’ve succeeded. What would you enjoy doing today given that knowledge? Clearly, certain personality types are more comfortable with iteration and failure than others. Do you think you can learn to be if it doesn’t come naturally? It’s obvious to me that there’s a certain personality type that can deal with failure more than others. But I think this awareness can also be acquired, especially when you realize that the failures that come out of experimentation really don’t relate to you as a person. It’s just the course of innovation; failure is a systemic part of that process. For instance, if you’re driving a car, and after three hundred miles the car runs out of gas, no one takes offense because the “failure” is inherent to the car, not to you. It’s not your failure to operate the car correctly. We all know that you have to refill the gas tank; that’s just the way it is. So if we think of failure in innovation in the same way—as having to refill the gas tank regularly—we can take it much less personally. That’s a great metaphor. So you think the idea of constant—and playful—experimentation is the best mind-set for innovation? It’s very uncommon for people to have the attitude of “Wow, I don’t know.” In childhood, researchers call this a “growth mind-set”—this idea that you’re comfortable with the fact that you just don’t know something yet, or that you just can’t do something yet. But most people are raised with this feeling that they know everything. But if you know everything, you can’t possibly innovate, right? It’s impossible, because there is nothing new to learn or discover. I think that the ability to see how much more there is to know and be humble about it is actually a good thing. Returning to the mountain metaphor, every mountain climber I know of feels small in the mountains and enjoys the feeling of being small. No matter what you do, the mountain is always bigger than you are. Make Your Mark is the third book in 99u’s “missing curriculum” for creative leaders. The two prior ones are Manage Your Day-to-Day: Build Your Routine, Find Your Focus, and Sharpen Your Creative Mind and Maximize Your Potential: Grow Your Expertise, Take Bold Risks & Build an Incredible Career. This book is absolutely gorgeous. I stared at it for hours. While it’s tempting to look at the recent work, it’s critical we understand the long history. Lima’s stunning book helps, covering the fascinating 800-year history of the seemingly simple tree diagram. Such an important part of natural life on earth, tree metaphors have become deeply embedded in the English language, as in the “root” of the problem or “branches” of knowledge. 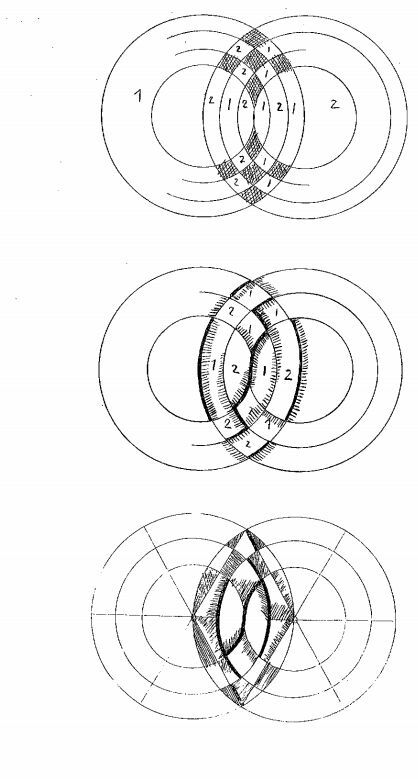 In the Renaissance, the philosophers Francis Bacon and Rene Descartes, for example, used tree diagrams to describe dense classification arrangements. As we shall see, trees really became popular as a method of communicating and changing minds with Charles Darwin. Our relationship with trees is symbiotic and this helps explain why it permeates our language and thought. As our knowledge of trees has grown through this and many other scientific breakthroughs, we have realized that they have a much greater responsibility than merely providing direct subsistence for the sheltered ecosystems they support. Trees perform a critical role in moderating ground temperature and preventing soil erosion. Most important, they are known as the lungs of our planet, taking in carbon dioxide from the atmosphere and releasing oxygen. As a consequence, trees and humans are inexorably intertwined on our shared blue planet. While we can’t go back in time it certainly appears like Charles Darwin changed the trajectory of the tree diagram forever when he used it to change minds about one of our most fundamental beliefs. Darwin’s contribution to biology—and humanity—is of incalculable value. His ideas on evolution and natural selection still bear great significance in genetics, molecular biology, and many other disparate fields. However, his legacy of information mapping has not been highlighted frequently. During the twenty years that led to the 1859 publication of On the Origin of Species by Means of Natural Selection, Darwin considered various notions of how the tree could represent evolutionary relationships among specifics that share a common ancestor. He produced a series of drawings expanding on arboreal themes; the most famous was a rough sketch drawn in the midst of a few jotted notes in 1837. 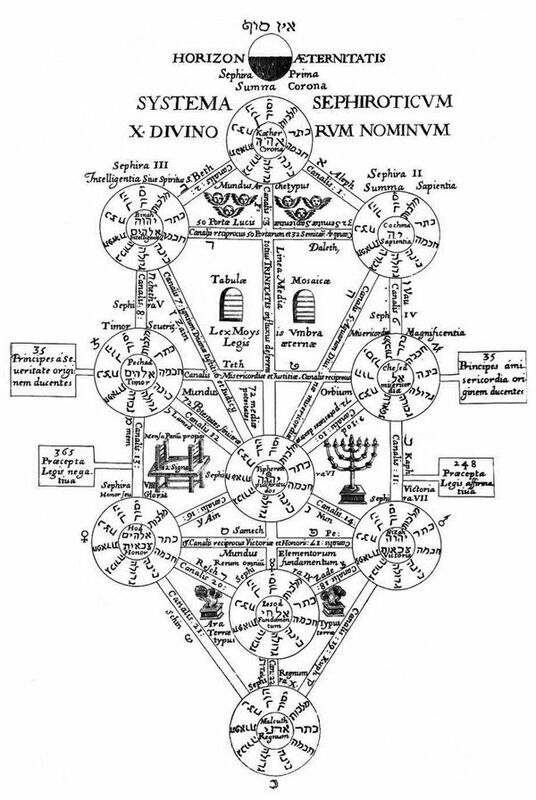 Years later, his idea would eventually materialize in the crucial diagram that he called the “tree of life” (below) and featured in the Origin of Species. Darwin was cognizant of the significance of the tree figure as a central element in representing his theory. 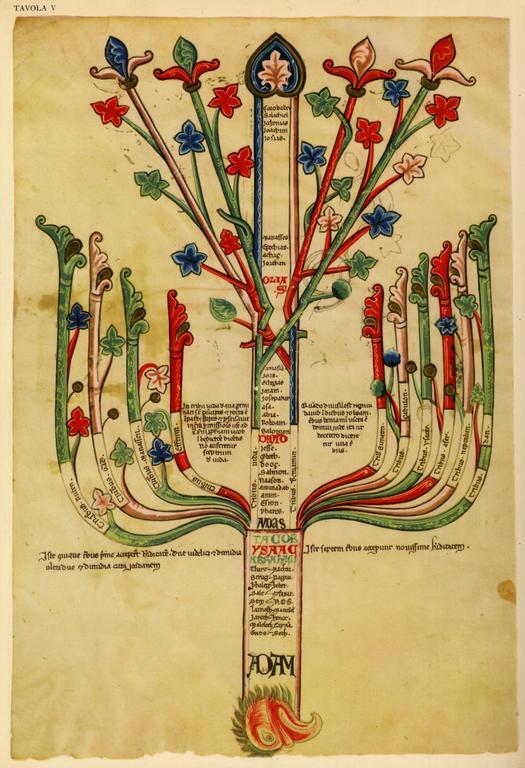 He took eight pages of the chapter “Natural Selection,” where the diagram is featured, to expand in considerable detail on the workings of the tree and its value in understanding the concept of common descent. 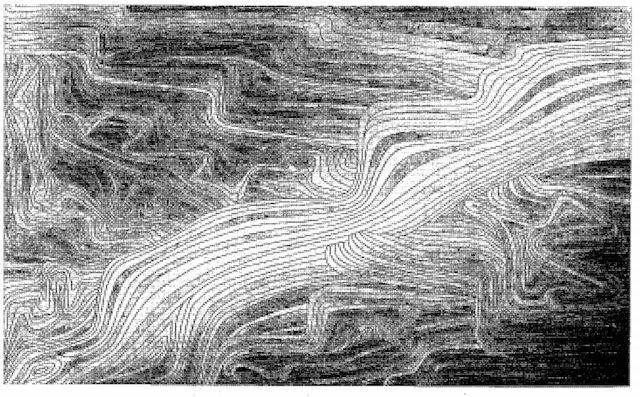 The illustration was clearly a “crucial manifestation of his thinking,” and of central importance to Darwin’s argument. As it turned out it was the tree diagram, accompanied by Darwin’s detailed explanations, that truly persuaded a rather reluctant and skeptical audience to accept his groundbreaking ideas. 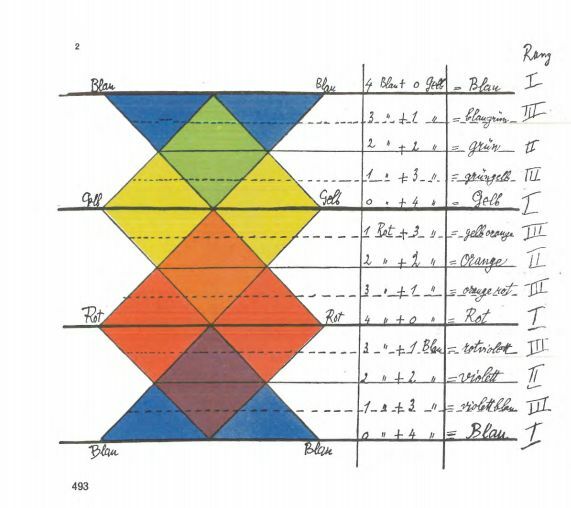 Coming back to the metaphor, before we go on to explain and show some of the different types of tree diagrams, Lima argues that given the long-lasting nature of the tree and its penetration into our lives as a way to organize, describe, and understand we can use the tree as a prism to better understand our world. As one of the most ubiquitous and long-lasting visual metaphors, the tree is an extraordinary prism through which we can observe the evolution of human consciousness, ideology, culture, and society. 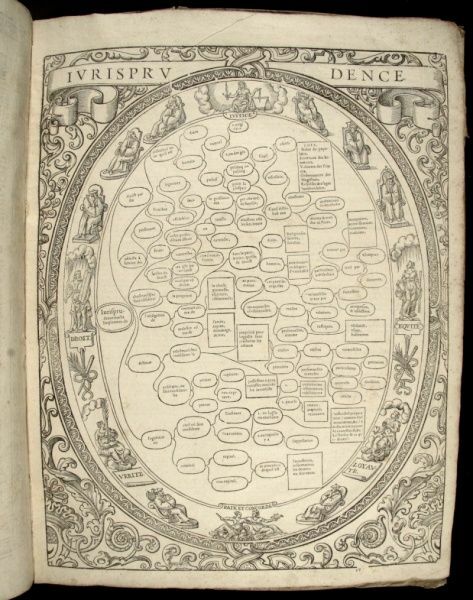 From its entrenched roots in religious exegesis to its contemporary secular digital expressions, the multiplicity of mapped subjects cover almost every significant aspect of life throughout the centuries. But this dominant symbol is not just a remarkable example of human ingenuity in mapping information; it is also the result of a strong human desire for order, balance, hierarchy, structure, and unity. 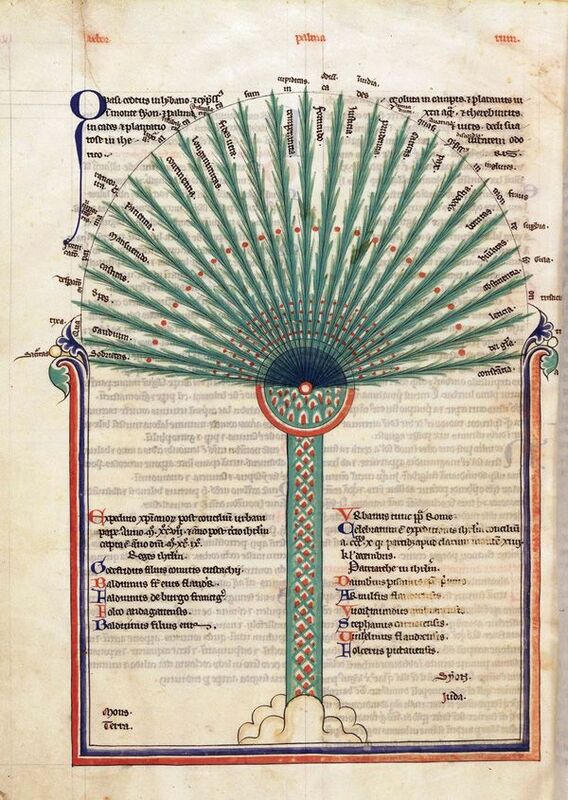 When we look at an early twenty-first-century sunburst diagram, it appears to be a species entirely distinct from a fifteenth-century figurative tree illustration. However, if we trace its lineage back through numerous tweaks, shifts, experiments, failures, and successes, we will soon realize there’s a defined line of descent constantly punctuated by examples of human skill and inventiveness. 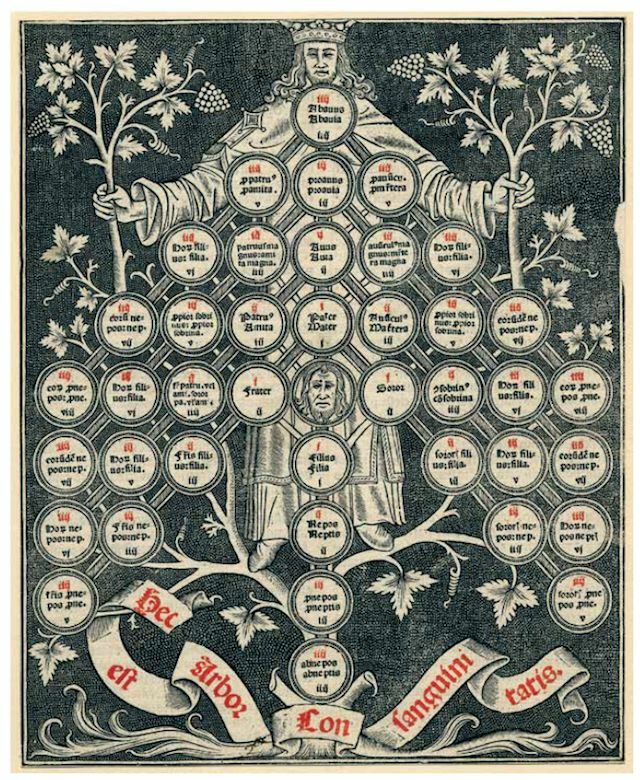 Trees have been not only important religious symbols for numerous cultures through the ages, but also significant metaphors for describing and organizing human knowledge. As one of the most ubiquitous visual classification systems, the tree diagram has through time embraced the most realistic and organic traits of its real, biological counterpart, using trunks, branches, and offshoots to represent connections among different entities, normally represented by leaves, fruits, or small shrubberies. 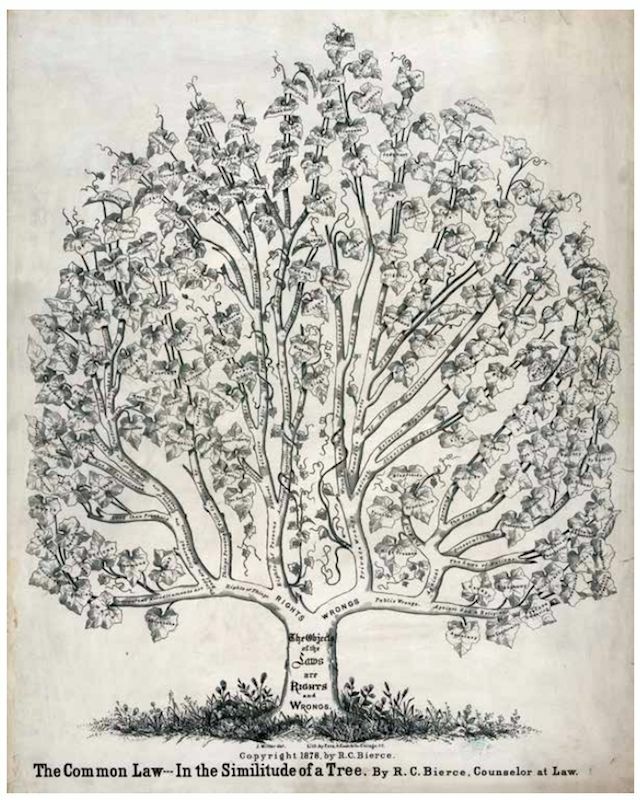 Even though tree diagrams have lost some of their lifelike features over the years, becoming ever more stylized and nonfigurative, many of their associated labels, such as roots, branches, and leaves, are still widely used. From family ties to systems of law, biological species to online discussions, their range of subjects is as expansive as their time span. The transition from realistic trees to more stylized, abstract constructs was a natural progression in the development of hierarchical representations, and a vertical scheme splitting from top or bottom was an obvious structural choice. … Of all visualization models, vertical trees are the ones that retain the strongest resemblance to figurative trees, due to their vertical layout and forking arrangement from a central trunk. In most cases they are inverted trees, with the root at the top, emphasizing the notion of descent and representing a more natural writing pattern from top to bottom. 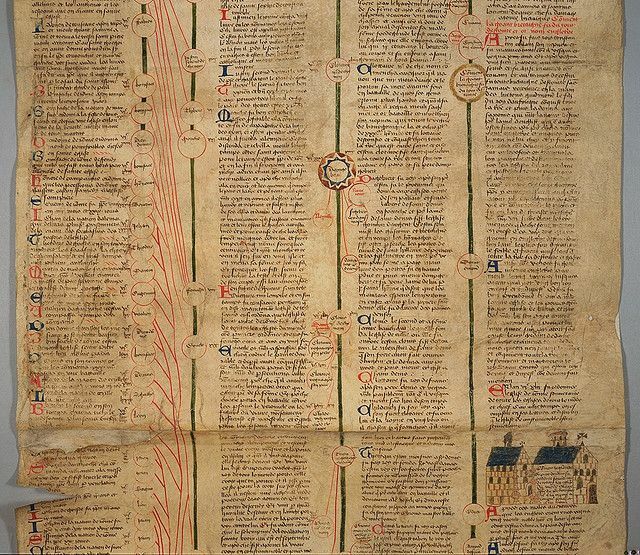 Although today they are largely constrained to small digital screens and displays, vertical trees in the past were often designed in larger formats such as long parchment scrolls and folding charts that could provide a great level of detail. 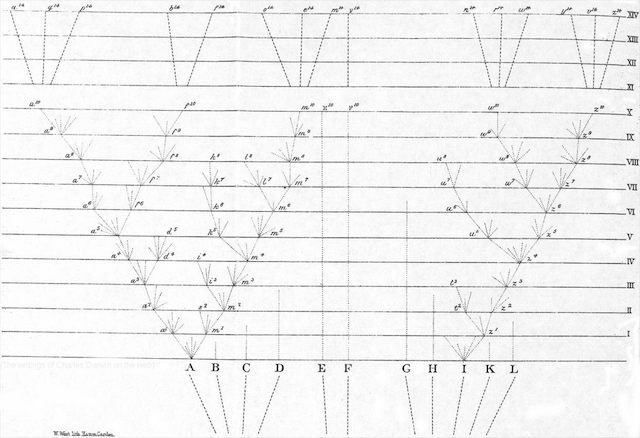 With the adoption of a more schematic and abstract construct, deprived of realistic arboreal features, a tree diagram could sometimes be rotated along its axis and depicted horizontally, with its ranks arranged most frequently from left to right. Horizontal trees probably emerged as an alternative to vertical trees to address spatial constraints and layout requirements, but they also provide unique advantages. The nesting arrangement of horizontal trees resembles the grammatical construct of a sentence, echoing a natural reading pattern that anyone can relate to. 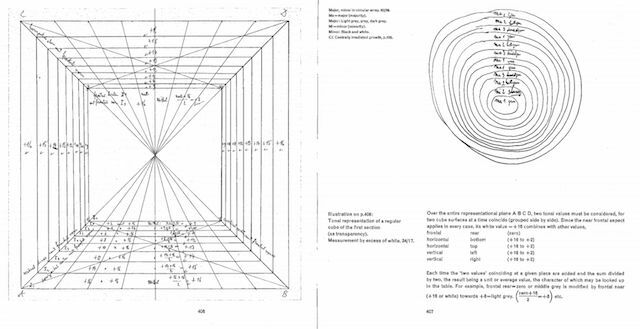 This alternative scheme was often deployed on facing pages of a manuscript, with the root of the tree at the very center, creating a type of mirroring effect that is still found in many digital and interactive executions. Horizontal trees have proved highly efficient for archetypal models such as classification trees, flow charts, mind maps, dendrograms, and, notably, in the display of files on several software applications and operating systems. 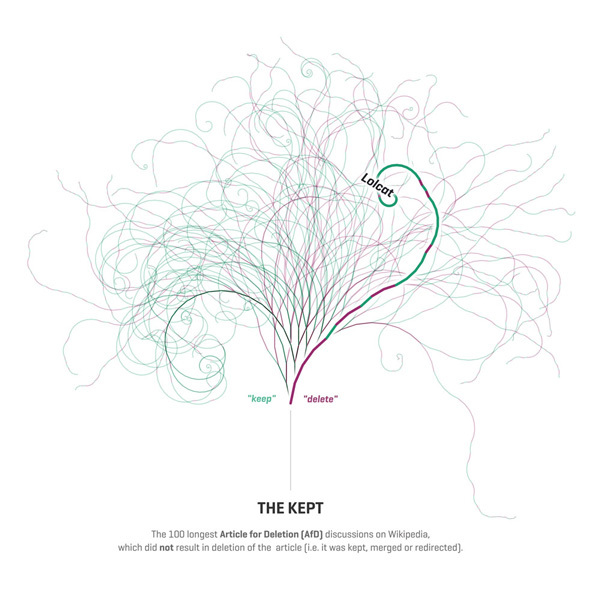 The Book of Trees: Visualizing Branches of Knowledge goes on to explore multi-directional, radial, hyperbolic, rectangular, Voronoi, and circular tree maps as well as sunbursts and icicle trees. 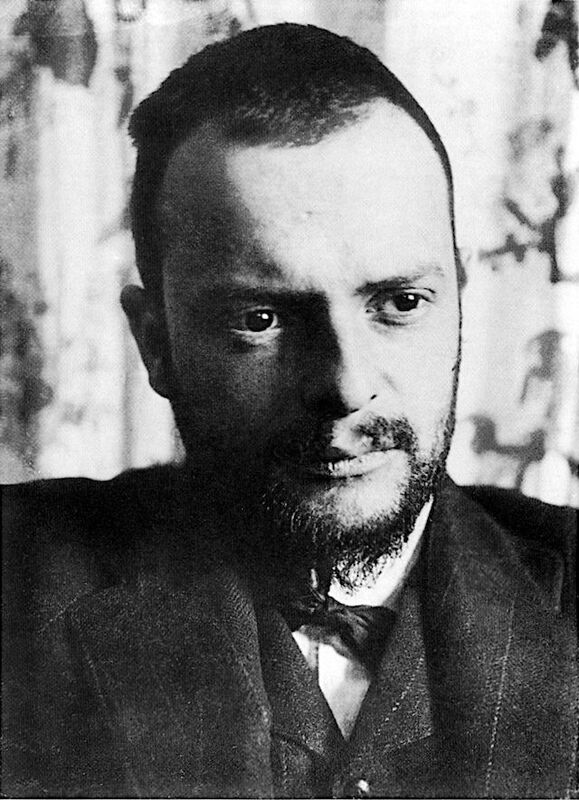 Paul Klee was a painter who wrote extensively about color theory. 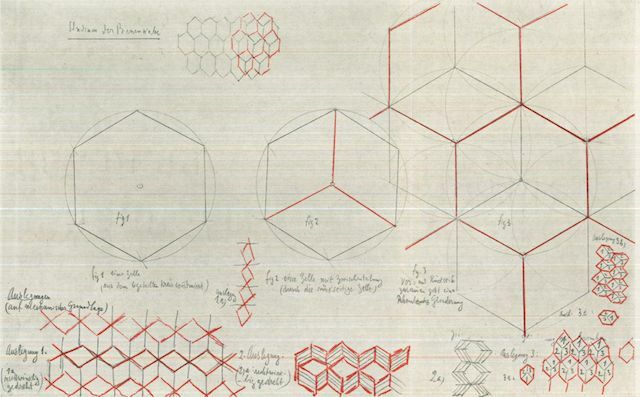 His lectures, Writings on Form and Design Theory, taught at the German Bauhaus school of art in the 1920s, were published in English as the Paul Klee Notebooks. They are considered as important to modern art as Leonardo da Vinci’s A Treatise on Painting was for the Renaissance. If you’re like me, prepare to spend the rest of your day in this treasure trove of amazingness. Still curious? The notebooks make an excellent addition to your budding art library.